Zoli adapted the interior door panels from the same Dodge Ram VTS kit that donated its chassis to this project. He scratchbuilt a Hurst Pistol Grip shifter handle (the top of which you can just see in the image above) and added flocking to the floor. Outside mirrors from a Dodge Viper kit continue the softened appearance started by the Challenger front bumper and valence panel. 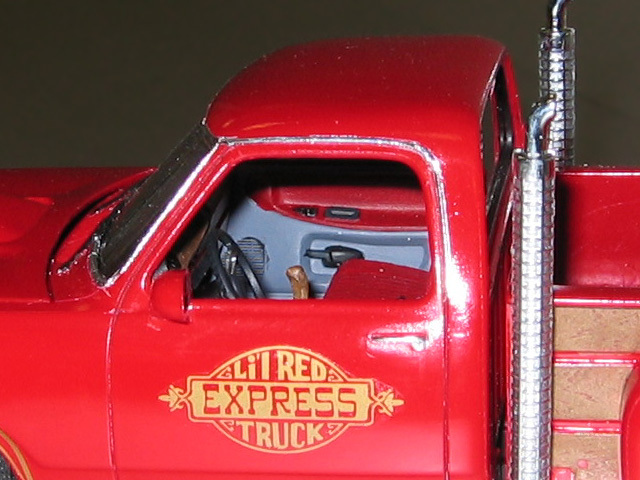 All the wood grain panels on the body and in the bed are covered with Detail Master woodgrain decals. Zoli cut the tinted rear window from a stip of processed unexposed film.